At godsera.com we believe in letting you choose. Hence, why all apparel images are blank; no shirt is made until YOU make it. Follow these 3 easy steps to personalize your apparel on godsera.com! Browse our apparel inventory to select your garment of choice. Here you will also see lettering position examples and current lettering colors. *Please note that our lettering colors, fonts et. al., are subject to change at anytime. After you select your desired: size, color and quantity and have 'added to cart', a personalization form will appear. Select lettering color and lettering position. *Selecting lettering color and lettering position is completely FREE and OPTIONAL. IMPORTANT! Any quantity over 1 will produce identical selections! 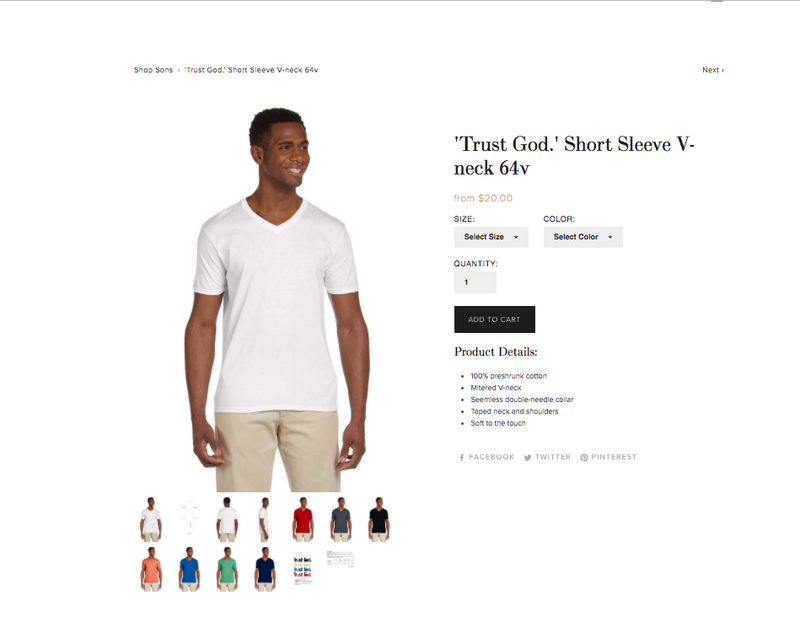 Example: You order a quantity of 3 white short sleeve v-neck shirts in size Large. You then select Red lettering and the Chest lettering position. ALL 3 shirts will be printed the same way. Add item(s) to shopping bag. Here, please carefully review and edit the details of your order before check out as all orders are FINAL SALE!